Take Your Clamps to The Work! This Mobile Clamp Rack will organize your clamps and get them close to your work area. When projects are finished, your clamps can be stored and parked out of the way until your next project. 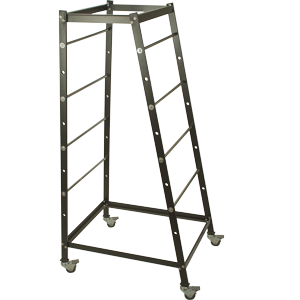 You can load up both sides of the rack with F-Clamps, parallel clamps or even pipe clamps and can easily be moved around the shop with four heavy duty swivel casters with brake locks. 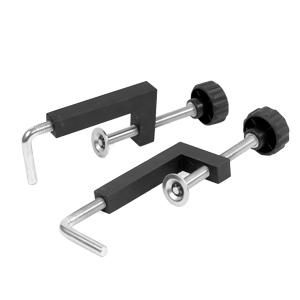 Steel clamp support rods can be inserted into different holes to provide a custom clamp layout for long or short clamps. The Frame is designed so that one side of the clamp rack is nearly 90° so that it will fit flat against the wall or in in a corner of your shop. Works great in large or small shops, where organization and storage is crucial. The Mobile Clamp Rack also doubles as a general storage system. The bottom of the clamp rack is designed to add a piece of plywood (not included) for storage of things like tools boxes, circular saws or even smaller air compressors. Also included are four steel shelf hooks to add a shelf that attaches to the support rods for extra storage space (shelf not included). Glue-up large or small panels with great looking, professional results every time with the Panel Max & Panel Max XL Glue Press System. The Panel Max makes stronger, more uniform joints than standard pipe or bar clamps. 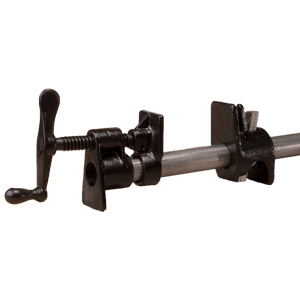 Unlike pipe or bar clamps, which tend to over-tighten on the bar side, The Panel Max applies even, uniform pressure to the stock surface since it completely surrounds the work piece, which creates superior quality joints with less hassle. 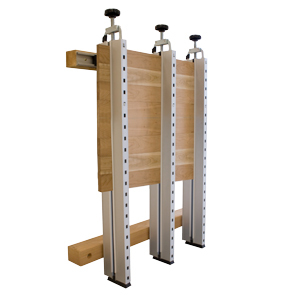 This system also cuts the surface area required for glue-ups down about 90% since it is mounted vertically to any wall in your shop and stays out of your way while the stock is drying. When considering purchasing wide boards consider this; wide stock pieces cost more and tend to warp when purchased from a store or lumber yard; with the Panel Max Glue Press you can glue up a series of narrow boards to produce wide, warp-resistant panels for much less money. The Panel Max also aligns your boards better than standard clamps, resulting in your panels gluing up flat which will require less planing and surfacing. 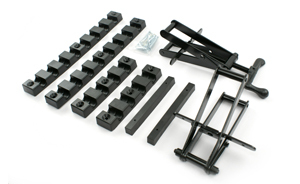 You can also add or remove clamp rails easily by sliding them out of the rails. 3 each of the 43" clamps and hardware. 1 each of the 39" mounting rails. 3 each of the 55" clamps and hardware. 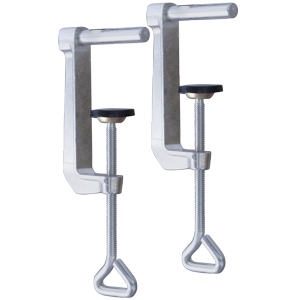 Attach the notched bars to any length 1-1/2" x 1-3/4" board (a 2" x 4" board ripped in half) with provided screws, set clamp and turn handle to tighten ( on large pieces, we recommend one clamp every 18" for maximum clamping efficiency). The clamp has plastic pressure pads so you don't damage the edge of your stock. Build any length clamp with the tough plastic bars with 12 notches for maximum adjustability to handle a variety of stocks widths. The clamp can be adjusted for boards up to 6" in thickness. Perfect for gluing table tops, furniture panels and more! Large panel glue-ups are now easier. Handles stock up to 6" thick. Buckling of boards is eliminated. Stock stays flat during glue-up. 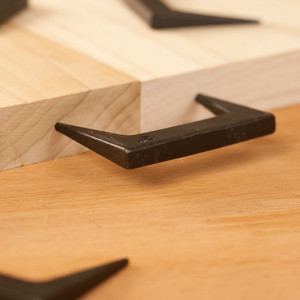 Drive a Pinch dog into an end grain along a wooden joint, doing this allows the steel tapered pinch dog clamps to draw boards tightly together for gluing up panels, table bench tops and more. You can use the Pinch Dogs repeatedly without the worry of them twisting, bending or breaking. Use them to square corners. Pinch Dogs can also be used for column assembly. 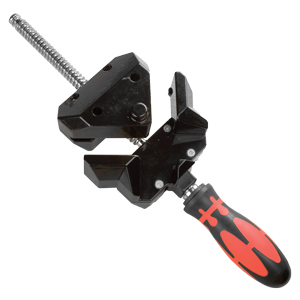 Our 90° Angle clamp features the power flex handle, which allows you to pull the handle out and rotate it to apply extra holding power to your stock. 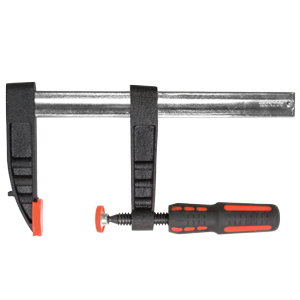 The clamp is perfect for gluing up frames, T-miters or just holding the stock in place. The unique design of the clamp automatically adjusts to the thickness of your stock as you tighten. Two holes are pre drilled on the bottom side of the clamp to accept table clamps (not included- sold separately) to keep the 90° clamp secure to the table top. 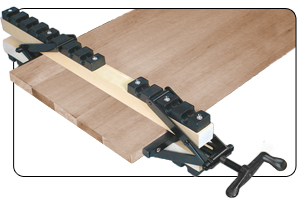 Requires one pair Table Clamps for one 90° Corner Clamp.